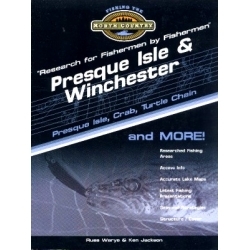 The Presque Isle and Winchester Wisconsin region with its location at the "top" of the state - alongside Michigan's Upper Peninsula - offer excellent fishing with a series of quality lakes - ranging from the namesake Presque Isle and Crab lakes to Birch Lake and the Turtle Chain (Rock, North Turtle, South Turtle lakes) of Winchester. Additionally, the town of Presque Isle bills itself as "Wisconsin's Last Wilderness" which reflects the quiet atmosphere of the glacial hills and pristine lakes, even during the busy days of summer. Presque Isle also is home to the Department of Natural Resources rearing ponds, which are used primarily to raise walleye fingerling for stocking in area lakes. With the location of both northwoods towns on the border, Michigan's Ottawa National Forest, located just across the state line, becomes a significant summer fishing attraction. Exploring the back roads of the national forest and "discovering" the small bass-panfish pothole lakes - from roadside to those located back in the woods - is a dramatic change from the larger lakes with more diverse fish populations - for example, Crab, Presque Isle, North and South Turtle, Oxbow lakes, etc. Excellent fishing resources are available. Walleye and muskie are clearly the traditional standards, although in recent years a growing smallmouth and largemouth bass fishery has attracted attention. Good panfishing, especially for crappie, bluegill, and rock bass, is available in area lakes for new and experienced anglers alike. Some of the lakes included in this book are: Adelade, Annabelle, Anne, Armour, Averill,Big, Big Kitten, Birch, Cathaline, Cedar, Crab, Harris, Hells Kitchen, Helmet, Horsehead, Little Crab, Little Horsehead, Little Papoose, Little Presque Isle, Lynx, Mabel, Mud, No Mans, North Bass, North Crab, North Turtle, Noseeum, Oxbow, Palmer, Papoose, Presque Isle, Rainbow, Rock, South Turtle, Stateline, Tamarack, Tenderfoot, Van Vliet and Wildcat lakes.